The custommade entertainment center is made of natural Texas pecan. The center features a large section with 3 shelves and two smaller sections which also have shelves. There are two large drawers at the botton which will hold CD's and DVD's. 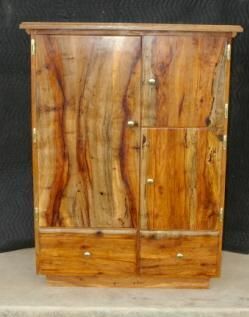 The custommade entertainment center has a hand rubbed oil finish. No stain has been used. Dimensions: 36" wide, 60" high and 18" deep.